Garden Adventures - for thumbs of all colors: Add Dazzle to your Garden with the new Sedum ‘Dazzleberry’. 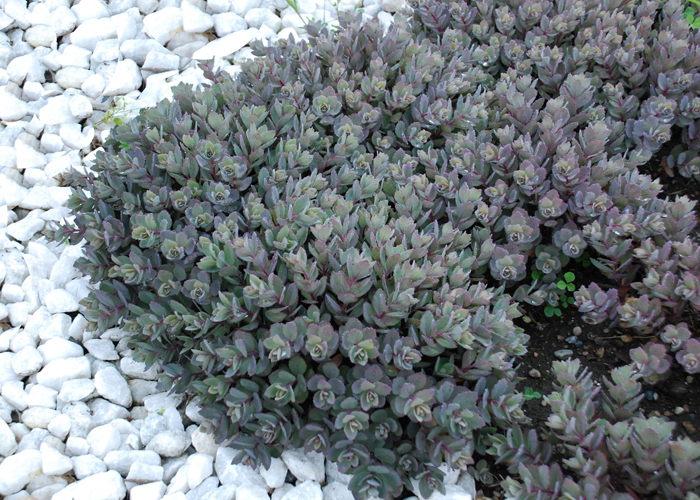 Add Dazzle to your Garden with the new Sedum ‘Dazzleberry’. I’m a great fan of low growing sedums. I use them in containers, either as solo plantings or mixed with other summer favorites where their succulent foliage and mid-late summer blooms add a welcome change , providing interesting combinations with the more traditional annuals such as million bells and geraniums. 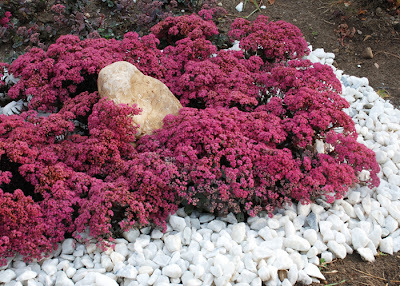 They also provide a wonderful carpet at the front of a border or on a rockery. 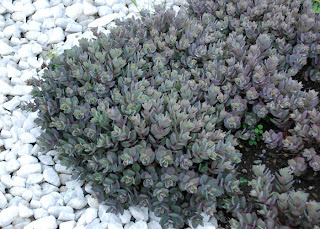 Brand new on the gardening scene and due for general release in 2012 is Sedum ‘Dazzleberry’. This exciting new groundcover caught my eye at the Garden Writers Association symposium in Indianapolis last week. It has been introduced by my friends at Great Garden Plants and promises to become everyone’s new favorite. Its smoky blue-grey foliage transitions to dark purple in late summer making a striking foil for the spectacular raspberry flowers. Yet these are far more than just another pretty flower. These blooms measure an unbelievable 9” in diameter, rivaling even the taller sedums for size and they even remain in color for over 7 weeks! This compact grower is only 8” tall and 18” wide making it a much needed addition to any drought-proof sun perennial border. The tight blue-grey foliage would complement any color. What about planting it in a cobalt blue container? I can envision this as a ribbon alongside a winding pathway, perhaps backed by some of the shorter coneflowers such as ‘Kim’s knee high’ (Echinacea purpurea). The dusky tones could also offer a beautiful color echo to some of the darker foliage shrubs such as Weigela ‘Midnight wine’ or the purple smoke bushes (Cotinus coggygria varieties). For a brighter note the perennial ‘Zagreb’ tickseed (Coreopsis verticillata) would add a touch of sunshine with its rich golden yellow rays, its feathery green foliage also providing an interesting change in texture from the fleshy sedum. I can also see it in combination with silvery foliage such as lavender or Russian sage (Perovskia sp.) which all share the same requirements for well drained soil, average fertility and full sun. For container gardens this is so compact as to make a perfect solo planting in a table top design. Tumbling over the edge of a mixed container it could be combined with feathery grasses and, colorful annuals in shades of chartreuse, orange and purple for a bold statement. Have I tempted you yet? Although it won’t be available in nurseries until next year, you can order it now from Great Garden Plants.